After I finished watching the Minnesota Timberwolves obtain an astonishing victory over the Golden State Warriors, my brain cooked up a scorching hot take — nothing unusual as my self proclaimed elite sports mind often does this — that I had to sleep on. #HotTake – Spurs have focused on getting better throughout season while the Warriors have chased a record. SAS quietly the best, once again. Now, maybe my hot take wasn’t even that crazy. I mean, San Antonio can still (SOMEHOW!!!!) get the number one overall seed in the conference and finish ahead of Golden State even though the country crowned Golden State back-to-back champions at the All-Star break, dubbed them the greatest team of all-time, placed Stephen Curry in conversations with Michael Jordan, and once again, fell asleep on the San Antonio Spurs. If you still don’t believe the Spurs can take the top seed of the Western Conference — and I’m not saying they are going to — let me explain further into detail incase your recently purchased Golden State Warriors snapback was blocking your vision. You might as well put it in the closet next to your Miami Heat one. You know, the one that you set down and reluctantly walked away from (heavy sarcasm)? The Warriors are currently 3.5 games ahead of the San Antonio Spurs with 4 games to play. It’s important to note that the Spurs have 5 games remaining with TWO of them against the Warriors — brilliant scheduling by the NBA… BRILLIANT!!!! In order for the Spurs to jump the Warriors they’ll need to win both games against the Warriors (claim the tie-breaker), and at least 2 of their remaining three games. Well, as long as Golden State doesn’t win more than one of their remaining four games. The chances of this happening are about as good as Draymond Green enjoying a long, beautiful walk along the coastline with Blake Griffin and Chris Paul simply for a conversation while taking in the scenery. All kidding aside, what will most likely happen is that the Spurs will sit their stars and wait until the playoffs to go toe-to-toe with the league’s most threatening team. Yes, I am aware that Tony Parker said he believed they’d play the remaining games down the stretch. Are you aware that their coach is Gregg Popovich? Yes, that means anything could happen. What I’m trying to say is that the Golden State Warriors aren’t in a league of their own. In fact, the Spurs are in the same conversation that is held before the next tier of contending teams. Both of these teams are staggering. So what the Spurs didn’t start the season 24-0. It’s a marathon, not a sprint. They’ve been chugging along since their 34-6 record through 40 games that placed them in the shadows of a 37-3 Warriors team. They’ve been sitting comfortably all season within listening range to how good the Warriors are and how nobody can play with them and how they’re going to run the next decade. Well guess what, San Antonio has once again been forgotten. It’s pretty clear that the Warriors will continue to be in the driver’s seat to finish out this season, and coast their car into the playoffs. That being said, their grip on the wheel isn’t as strong as most would suggest. Without further ado, my hot take — The Warriors loss to the Timberwolves tells me more about that team than the win does about Minnesota. EVERYBODY KNOWS HOW GOOD THE TIMBERWOLVES ARE GOING TO BE. EVERYBODY!!!!! I didn’t need an overtime win against the Warriors to think highly of the young talent on that roster. The national media apparently just figured out why Karl-Anthony Towns went first in the draft this year, and must’ve remembered Andrew Wiggins was selected first the draft before. I can save the overdose of optimism for the Timberwolves in a different — yet just as special — article at a different time. Congratulations to the fans of the Minnesota Timberwolves. You guys for real won the lottery… twice. And I’m not talking about the NBA Draft Lottery (Well, technically I am, but whatever.) I’m talking about the real lottery. You have Andrew Wiggins and Karl-Anthony Towns together on rookie contracts (!!! ), you should for real throw a parade just for that. By the way, shoutout to Shabazz Muhammad for the 35 point explosion off of the bench. I don’t think he has received enough love for making sure the Wolves stayed in that game. But anyways, moving on. I think that game was evidence that chasing this record has officially worn out the Warriors. They have looked EXHAUSTED the last few weeks as it seems like damn near everybody is not only covering their spreads, but commonly taking this team to overtime. I’m not asking you to call the hot take police either, I’m just saying what I’m seeing. I’m also not saying that they’ve lost the thought of what they’re playing for, but maybe that they’ve made two separate, gigantic goals. Almost as if saying mission one is 73 wins and we’ll come back for the Larry O’Brien. If they can pull it off than great, more power to them! But to me, that just sounds exhausting and I’m not even the one playing the games. Of course, there is the theory that they’re bored and will go through the playoffs holding every team’s owner hostage as Draymond Green holds each team’s best player by the throat against the base of the basket. As good as the Golden State Warriors have been, the San Antonio Spurs have been just as consistent if you ask me. The beautiful thing about the Spurs is that they’ve been periodically getting their stars and key players rest as the season has progressed. While doing this, it has allowed players who normally wouldn’t see the court get a lot of experience and grow into players that fit roles Popovich can pick and choose from for playoff lineups. Players from Kawhi Leonard to Kyle Anderson to Boban Marjanovic have developed into better pieces from month to month while the Warriors have been an extremely well oiled machine chasing a record, until lately. Are we positive the Warriors are even the best team in the NBA? Would you bet your life on it? The mighty have fallen on their sword and San Antonio is ready for it — comfortably sitting within striking distance. If San Antonio can somehow take advantage of the slipping Warriors, we’ll likely laugh and talk about how that’s totally Spurs-ish. The Patriots of the NBA. Write them in for the Western Conference Finals, at least. Regardless of Golden State reaching 73 wins or not, I know 7 things are for sure while 3 things are not. 1. They aren’t better than Jordan’s Bulls without a title this season. Even with a title, how many people would actually admit — if true — that they’re better? 2. A 7-Game Series between the San Antonio Spurs and Golden State Warriors is what America wants and is what America needs. Actually, I can’t say I know what America wants or needs, but I know this is what I want and need. Just kidding. I want the Celtics to win the title every season until I die and I need water, oxygen, and pizza. But this series would be really fun. 3. The team that actually holds the record for the best regular season of all-time isn’t even the greatest team of all-time. Well, there is no consensus pick, but I’d argue for the ’86 Celtics. 4. Neither team really wants to face Oklahoma City before they will likely play each other in the Western Conference Finals. You think anybody is trying to mess around in a series with Kevin Durant and a guy who played regular season games with a broken face? 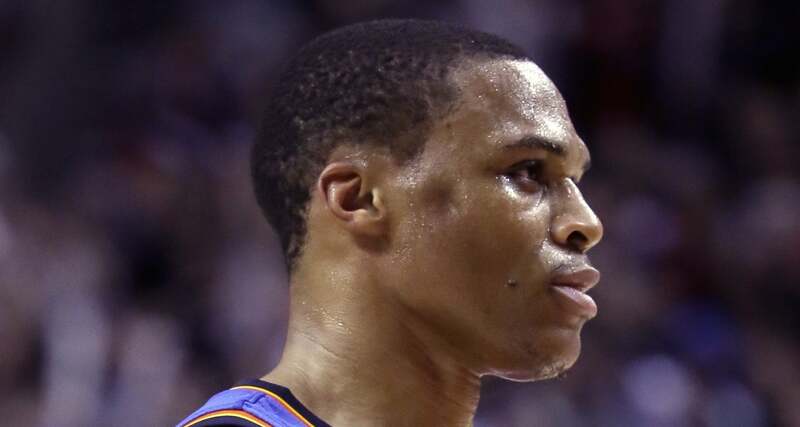 A DENT WAS IN WESTBROOK’S FACE. 5. There is a real chance that a series will come down to Kawhi Leonard putting a gigantic Rawlings baseball mitt over one of his massive hands and holding Stephen Curry in it during crunch time, or the two-time MVP raining 30-foot bombs on the best defender since Scottie Pippen. Either way, the basketball Gods are torturing us viewers. If this happens, at any moment every single social media platform could collapse. 6. If Steve Kerr not only secures the record of 73 wins, AND wins his second title in his second season he’s either a hybrid child created from his former basketball coaches — Gregg Popovich and Phil Jackson — or he’s the luckiest man in sports since David Tyree made the helmet catch. By the way, Plaxico Buress was the luckiest man of the helmet catch scenario, not David Tyree. Without the helmet catch, Plaxico would just be “guy who shot himself in the leg”. Now he’s at least “Super Bowl champion that later shot himself in the leg”. Totally not a big deal when your comeback is flashing that big ol’ ring. 7. At any point Klay Thompson could become the best shooter in the series between the Spurs and Warriors because the best defender on the court is being used as Stephen Curry’s backpack. To be fair, Klay Thompson could become the best shooter in the series because he’s anywhere between the 6th and 9th best three point shooter to ever live. Klay Thompson also owns the 22nd most exciting experience in my life for scoring 37 points in one quarter. 1. I’m unsure if Kawhi Leonard has the mentality to not back down against Draymond Green if it came to it. To be fair, we’ve seen a younger, less talented version of Kawhi look as if he was LeBron’s krytonite in the Finals. So, I guess I’m only unsure of two things. 2. I’m unsure if Tim Duncan and I are the same species. Tim Duncan is 39-years-old and about to have his 18th NBA playoff fight. I’m 19-years-old and am typing this article at 11:43 on a Wednesday night hoping to get 1,000 views. 3. If I had to bet on a Spurs/Warriors series, I’m unsure of which team I’d take. One side — Golden State — has the best player in the series, youth, a player that transforms into a Decepticon during overtime, a better shooting clinic than the final 30 minutes of 3:10 Yuma, and they have a player on their bench from Brazil that’s faster than Usain Bolt. The other side — San Antonio — has three future Hall of Famers that have been written off since 2010 and have still managed to reach two NBA Finals since 2010, winning one. They have the new aged Dirk Nowitzki, the best defender that I’ve ever seen in my life, a rotation that’s capable of reaching the bottom of the Earth, a 39-year-old that eats forbidden fruits and other unidentified plants from the Philippines because he’s actually an alien, a coach whose only weakness is in-game-interviews, and an undefeated home court advantage. Yes, undefeated. Hard to tell what’s going to happen, Curry shooting 1 for 12 from three against the Spurs in San Antonio, but being able to drop 37 their first matchup when they had home court. Home court advantage may be a deciding factor in a matchup between the two, especially if the Spurs can remain undefeated at home. I pray and hope to see one of the greatest match ups in the history of the NBA.